At Industrial Television Services (ITS), our experienced creative, technical, and support teams handle every step of your project from the custom design phase all the way to implementation. We are your single point of contact for a full-service solution, working closely with you to determine goals, provide solutions, and achieve a successful installation. We don’t stop there – your system is supported 24/7, by real people. 24 hours, 7 days a week. All year round. Managing real-time, customized information displays is not a part time job. At ITS, we maintain a full-time service & support desk to ensure your network is always running effectively. We assure you that your service requests will be responded to promptly by an ITS representative. For convenience, maintenance and repair services may be either on-site or remote. 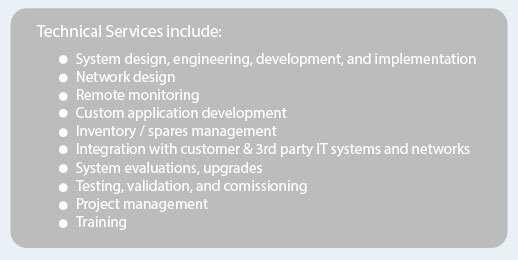 Contract service customers are given priority and receive on-site service within their SLA’s. Customer service requests requiring highly technical responses are escalated to ITS’s engineering group. Our talented creative services team will work with you personally to deliver engaging, meaningful content. We want your brand to be represented the way it was intended to be, while still offering a cohesive, eye-catching solution. We bring over 50 years of expertise to the table. From system and network design through testing and validation, ITS not only manages your real-time digital systems, but also leverages our experience and expertise to streamline your project. We will be happy to find the answers you’re looking for.